New furniture can make your home feel like new, and when you splash out on that lovely new sofa, the last thing that you expect is that it might not turn up, or may turn up on time but not fit through the door or up the stairs! The key when ordering new furniture, whether it's online or from a store on the high street, is to know exactly what you want, whether it will fit and when you need it. If you're ordering something that you need by a certain date, make sure that you specify right at the point of purchase that you must have the item by that date. By doing this (and insisting that they make a record of it, too) you are making time of the essence, a legal term which means you are adding another condition to the contract that you make when you buy the furniture, and that gives you the right to cancel the contract without penalty if the retailer says they can no longer supply the goods by the date you agreed. When you've ordered some furniture - perhaps a bed or a sofa in time for a relative's visit, it may be very important to you that it's there on time. You can either express this at the time of sale - or if there's a loose 'delivery will be within six weeks' agreement but you find out that there's going to be some delay, you can make 'time of the essence' at a later date, as long as you set a reasonable date and do it in writing. You can also do this if you've accepted that there may be a delay, but it's now getting to the stage where time is dragging on, and you feel like you are being 'fobbed off'. If, for example, you ordered furniture that should have been delivered 'within four weeks' but after five weeks it's not with you, it's perfectly acceptable to say that you'll accept a further delay of a few weeks and then, if the goods still show no sign of arriving, tell the retailer that you are 'making time of the essence' and if the delivery isn't with you by whichever reasonable date you set, you will cancel the contract. If you're forced to do that, you should receive all of your deposit back and be able to cancel with no penalty to you. You must also make sure that you do this in writing and quote the phrase 'making time of the essence' as it's a legal term that you can rely on if you need to take legal action. The sensible thing when you order any large piece of furniture is to make sure that it will fit where you need it before you order it. 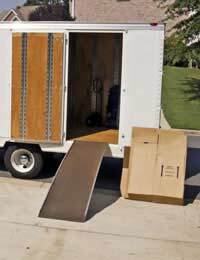 This also means that you should take into account whether it will fit through the door, or whether you'll be able to fit it up the stairs if it's bedroom furniture. If the worse comes to the worst and you have furniture delivered that just won't go where you need it to, legally it's your fault. Harsh, but fair. Some retailers will take pity on you and let you send the item back, but as far as they are concerned, it's the goodwill of the seller that you're relying on and not a legal obligation. If there really is no way that you can get the item into the house, there may be little choice but for the delivery men to take it back on the van and you'll have to negotiate with the store to see whether they are prepared to offer you a refund. They are more likely to let you have a 'credit note' so that you are obliged to buy more furniture from them - and they don't even have to do that, so you can't insist on more if that's all they will offer you. The only variation to this is when you order something - having measured up - and it's not the right measurements when it arrives. If the retailer has made a mistake in the description, they are in breach of their contract to you and unless there is another way around it, they have to give you your money back. As with all big purchases, when it comes to buying furniture, planning is key. Make sure it's what you want, that it will fit where you need it to, and that you tell the seller when you need it, and you shouldn't go far wrong. Just had a wardrobe delivered from Barker and Stonehouse Middlesbrough, does not fit,I am a frequent customer of this expensive store,there customer service went like this,as discretion would take it back,-40% of the cost of goods for handling,£90 to put 6 scews in and another £40 to pick up goods, good total was £399 with deductions they would offer me £40 back, SOME CUSTOMER SERVICE, THEY SHOULD BE ASHAMED OF THEMSELVES.